In vertebrates, the arrestins are a family of four proteins that regulate the signaling and trafficking of hundreds of different G-protein-coupled receptors (GPCRs). Arrestin homologs are also found in insects, protochordates and nematodes. Fungi and protists have related proteins but do not have true arrestins. Structural information is available only for free (unbound) vertebrate arrestins, and shows that the conserved overall fold is elongated and composed of two domains, with the core of each domain consisting of a seven-stranded β-sandwich. Two main intramolecular interactions keep the two domains in the correct relative orientation, but both of these interactions are destabilized in the process of receptor binding, suggesting that the conformation of bound arrestin is quite different. As well as binding to hundreds of GPCR subtypes, arrestins interact with other classes of membrane receptors and more than 20 surprisingly diverse types of soluble signaling protein. Arrestins thus serve as ubiquitous signaling regulators in the cytoplasm and nucleus. The arrestin family has four members in mammals: arrestin1 (called visual or rod arrestin in some species, and previously called S-antigen or 48 kDa protein), arrestin2 (also known as β-arrestin or β-arrestin1), arrestin3 (β-arrestin2) and arrestin4 (cone arrestin or X-arrestin). Structurally and functionally the family can be subdivided into two subfamilies: visual or sensory (arrestin1 and arrestin4) and non-visual (arrestin2 and arrestin3) . Fish and amphibians have a rod arrestin, a cone arrestin and at least one non-visual arrestin; insects have at least two sensory arrestins and one non-sensory arrestin (called Kurtz in Drosophila melanogaster), whereas other invertebrates (such as Caenorhabditis elegans) and protochordates (such as Ciona intestinalis) have only one arrestin homolog. Chromosomal locations and accession numbers are shown in Tables 1 and 2, respectively. Arrestin1, 2L; Arrestin2, 3L; Kurtz, 3R†. Arrestin2, 2; Arrestin3, 3; Arrestin4, 2†. Rod arrestin is also called arrestin1; cone arrestin is also called arrestin4. *Position as indicated in the GeneBank entry for this gene. †For insect arrestins, each protein name is followed by a chromosomal location. Rod arrestin is also called arrestin1; cone arrestin is also called arrestin4. In vertebrates, arrestins are encoded by large (13-50 kilobases) genes containing 14-17 exons, some of which are only 10 nucleotides long [2, 3]. This multi-exon structure appears to be ancient, as the sole arrestin in the protochordate C. intestinalis is encoded by 13 exons, with the positions of nine introns corresponding to those in bovine rod arrestin (arrestin1) . The arrestin gene in C. elegans has ten exons , whereas the genes in D. melanogaster are simpler, having only three or four exons . The positions of five introns are identical in C. elegans, C. intestinalis and bovine rod arrestin, suggesting that they were acquired by a common ancestor gene. The exons do not correspond to known structural elements of arrestins, which consist of two domains and a variable carboxy-terminal tail [7–9], with one interesting exception: one of the exons conserved from C. elegans to mammals contains the phosphate-binding motif homologous to a motif in ataxin-7, a protein mutated in olivopontocerebellar atrophy with retinal degeneration . The multi-exon structure of vertebrate arrestins gives rise to splice variants of rod arrestin and both non-visual subtypes . The short splice variant of rod arrestin lacks most of the carboxy-terminal tail and has functional characteristics distinct from the longer variant: it binds unphosphorylated rhodopsin  and has a different subcellular localization in rod photoreceptors. The long and short forms of the two non-visual arrestins differ by 8 or 11 residues in the proximal carboxy-terminal tail; the functional significance of this is unclear [11, 13]. Ancestors of arrestin proteins probably appeared early in the evolution of eukaryotes, before the separation of animals, plants and fungi. Yeast and several other species of fungi have related proteins of the PalF family . These proteins of about 80 kDa have two approximately 150-residue regions that are homologous to the cores of the two arrestin domains. Three predicted proteins (accession numbers EAS01748, EAS01749 and YP_053990) from two species of Ciliophora - Paramecium tetraurelia and Tetrahymena thermophila - show homology with the same central part of arrestin that has homology to PalF proteins. These proteins and members of the PalF family lack most of the structural features that are the hallmarks of 'true' arrestins, however. So far, no arrestin-related proteins of plant origin have been described. 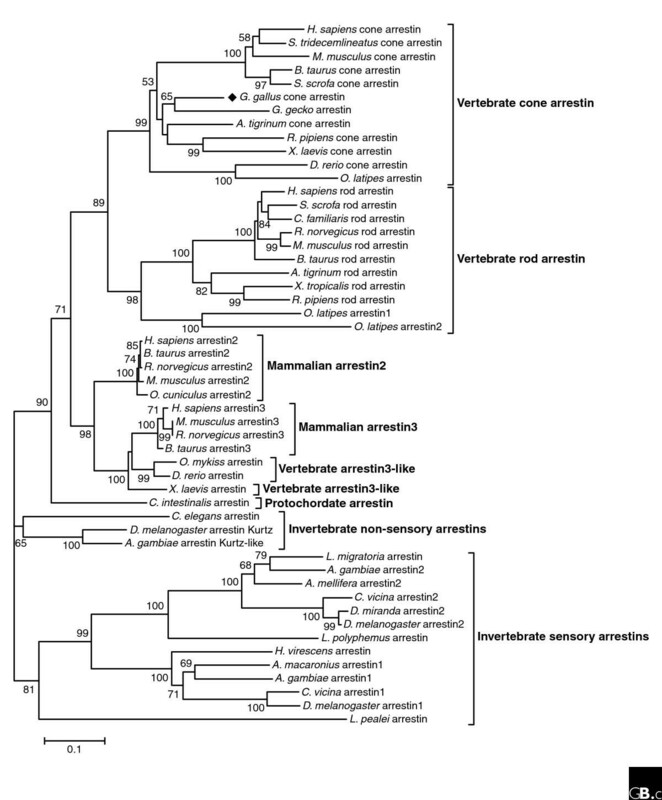 Analysis of the phylogenetic tree of arrestins (Figure 1) shows that vertebrate arrestins are divided into visual and non-visual branches; the visual branch further subdivides into rod and cone arrestins (arrestin1 and arrestin4) and the non-visual branch into arrestin2 and arrestin3. Vertebrate non-visual arrestins are the least diverse group. They are closer to the invertebrate non-sensory subtypes than to any other group (Additional data file 1). Arrestin2 has so far been found only in mammals; it is much more abundant than arrestin3 in mammalian cells, especially in mature neurons, where overall non-visual arrestin expression levels are the highest . The greater homology within the arrestin2 group than among arrestin3 proteins in mammals suggests that arrestin2 may be the latest evolutionary addition to the family. Arrestins from C. elegans and C. intestinalis and Kurtz in Drosophila seem to be 'hybrids': they are expressed throughout the nervous system and support receptor internalization, similarly to the vertebrate non-visual arrestins, yet participate in olfaction and vision, similarly to the visual/sensory subtypes [4, 5, 16]. Thus, the first proto-arrestins apparently emerged before the separation of the main branches of eukaryotes. True arrestins in animals evolved before the separation between the vertebrate and invertebrate lineages and then diverged into visual and non-visual groups early in the evolution of both lineages (Additional data file 1). A phylogenetic tree of the arrestin family. Amino-acid sequence alignments were performed using ClustalW in the MEGA3 software. The phylogenetic tree was created using the neighbor-joining method (gap settings: pairwise deletions; distance method: number of differences). Numbers at selected nodes indicate the percentage frequencies of branch associations on the basis of 1,000 bootstrap repetitions (all percentages over 50 are displayed). Brackets on the right indicate subfamilies. The proteins included for each species, with accession numbers, are as follows: Ambystoma tigrinum (tiger salamander) rod arrestin (AAF14636) and cone arrestin (AAF14637); Anopheles gambiae (African malaria mosquito) arrestin1 (AAG54081), arrestin2 (DAA00888) and Kurtz-like (DAA00889); Apis mellifera (honey bee) XP_623243 (predicted); Ascalaphus macaronius (neuropteran insect) CAC36938; Bos taurus (cattle) rod arrestin (NP_851343), cone arrestin (BAA94344), arrestin2 (NP_776668) and arrestin3 (P32120): C. elegans (nematode) NP_508183; Calliphora vicina (bluebottle fly) arrestin1 (P51486) and arrestin2 (P51487); Canis familiaris (dog) rod arrestin (NP_001003230); C. intestinalis (sea squirt) BAB60819; Danio rerio (zebrafish) cone arrestin (NP_001002405) and arrestin3 (NP_957418); D. melanogaster (fruit fly) arrestin1 (NP_476681), arrestin2 (NP_523976) and Kurtz (NP_524988); Drosophila miranda (fruit fly) arrestin2 (P19108); Gallus gallus (chicken) cone arrestin (XP_420156, predicted); Gekko gecko (tokay) cone arrestin (AAQ94621); Heliothis virescens (tobacco budworm) AAB25861; Homo sapiens (human) rod arrestin (NP_000532), cone arrestin (AAB84302), arrestin2 (NP_004032 isoform A) and arrestin3 (NP_004304 isoform 1); Limulus polyphemus (Atlantic horseshoe crab) P51484; Locusta migratoria (migratory locust, insect) P32122; Loligo pealei (squid) AAK84368; Mus musculus (mouse) rod arrestin (AAH16498), cone arrestin (AAG38954), arrestin2 (NP_796205 isoform A) and arrestin3 (NP_663404); Oncorhynchus mykiss (rainbow trout) arrestin (P51466); Oryctolagus cuniculus (rabbit) arrestin2 (AAC48753); Oryzias latipes (killifish) rod1 arrestin (BAA82259), rod2 arrestin (BAA21718) and cone arrestin (BAA21719); Rana pipiens (northern leopard frog) rod (CAA63135) and cone (CAA63137); Rattus norvegicus (rat) rod (NP_037155), arrestin2 (NP_037042) and arrestin3 (NP_037043); Spermophilus tridecemlineatus (squirrel) cone arrestin (AAS89816); Sus scrofa (pig) rod arrestin (NP_999244) and cone arrestin (NP_999510); Xenopus laevis (frog) cone arrestin (AAH94203) and arrestin3-like (AAH76815); and Xenopus tropicalis rod arrestin (NP_989073). Arrestins are ubiquitous (that is, every cell in animals has at least one arrestin subtype) regulators of G-protein-coupled receptors (GPCRs), the largest known family of signaling proteins. Arrestins bind to the cytoplasmic side of active phosphorylated forms of their cognate receptors, usually engaging the carboxyl terminus and several cytoplasmic loops of the receptor . Arrestins shut off G-protein-mediated signaling, target receptors to coated pits for internalization and redirect GPCR signaling to a variety of G-protein-independent pathways, such as the activation of the protein tyrosine kinase Src, mitogen-activated protein (MAP) kinase cascades, and so on [1, 17]. The length of arrestin proteins is fairly well conserved from C. elegans to humans, in the range of 360-470 residues. Crystal structures of three out of the four subtypes of vertebrate arrestins have been solved: bovine rod arrestin , bovine arrestin2  and salamander cone arrestin . Each of these arrestins is an elongated molecule with two domains (amino-terminal and carboxy-terminal) and an extended carboxy-terminal tail that makes a strong contact with the body of the amino-terminal domain (Figure 2). The relative orientation of the two domains in the basal conformation of free arrestin in solution is supported by two characteristic groups of intramolecular interactions or 'clasps' (Figure 2a). Extensive mutagenesis studies indicate that both of these clasps are unfastened by receptor-attached phosphates, so that receptor binding induces a global conformational change in arrestin . This rearrangement involves the release of the arrestin carboxy-terminal tail [19, 20] and the movement of the two domains relative to each other, which is limited by the length of the inter-domain hinge . The structures of visual and non-visual arrestins from mammals and amphibians show a remarkable conservation of overall fold . Not surprisingly, the key residues that stabilize the basal conformation are conserved in all animal arrestins (Additional data file 2). Extra sequences (sometimes up to 25-30 residues) in the largest members of the family (such as Kurtz) are localized at the amino and carboxy termini or in the loops between putative β strands. Extra residues (including tags) added to these elements of vertebrate arrestins do not compromise their folding or functionality [22–24]. Key structural elements of arrestin proteins. This model of a generic arrestin molecule was generated in ViewerPro using the crystal structures of bovine rod arrestin  and arrestin2 . The proximal carboxy-terminal tail (dark gray) missing in the structures has been modeled arbitrarily. (a) Intra-molecular interactions holding arrestin in the basal conformation. The structure is shown in ribbon representation, except for the residues in the polar core (blue, positive charges; red, negative charges) and the hydrophobic residues in the three-element interaction (yellow), which are shown in space-filling representation. Dark gray indicates the carboxy-terminal tail; magenta, the lariat loop in the carboxy-terminal domain containing two polar core negative charges; light brown, the inter-domain hinge (at the back of the molecule). The polar core is a cluster of five virtually solvent-excluded charged residues, which is unusual for a soluble protein; it includes one negative and one positive charge in the amino-terminal domain, two negative charges in the lariat loop of the carboxy-terminal domain and one positive charge in the carboxy-terminal tail. The three-element interaction is mediated by clusters of bulky hydrophobic residues in β-strand I, α-helix I and the carboxy-terminal tail. (b) Known interaction sites on the arrestin molecule. Receptor-binding elements: blue, positive charges that bind receptor-attached phosphates ; yellow, hydrophobic residues in β-strand X ; green, elements that determine receptor specificity . Other elements: magenta, the clathrin-binding element in the proximal carboxy-terminal tail ; red, AP2-binding residues in the distal carboxy-terminal tail . Each arrestin domain is an independent folding unit. Separated domains are functional: the amino-terminal domain preferentially binds active phosphoreceptors, albeit with lower affinity than the full-length protein; the carboxy-terminal domain does not [13, 22]. Both domains bind microtubules with even higher affinity than full-length arrestin . The arrestin fold was considered unique until a recent unexpected discovery of a very similar structure in Vps26 (vacuolar protein sorting-associated protein 26, a subunit of the retromer complex, which is involved in the recycling of the sorting receptor from endosomes back to the Golgi) . This 327-residue protein has two β-strand sandwich domains with an arrestin-like design and relative orientation. The inter-domain contact surface of Vps26, remarkably similar to that of arrestins, includes an analog of the polar core and an extensive set of hydrophobic interactions, even though Vps26 has no detectable sequence homology with arrestin family . Arrestins are soluble, predominantly cytoplasmic proteins. Binding to phosphorylated active GPCRs and termination of G-protein-mediated signaling (receptor desensitization) was the first arrestin function described. The ability of arrestins to link GPCRs to the components of the internalization machinery - clathrin  and AP2  - was interpreted as a natural extension of their desensitizing function. Subsequent discoveries that receptor-bound arrestins interact with numerous signaling proteins, linking GPCRs to a variety of alternative signaling pathways (Table 3), put arrestins on an equal footing with G proteins as a different class of signaling adaptors recruited by active receptors [1, 17]. The interaction of arrestins and G proteins with overlapping sets of cytoplasmic receptor elements underlies their direct competition , and in most cases receptor phosphorylation gives arrestin an edge over G proteins . *This table includes only arrestin binding partners that are not GPCRs. For a list of GPCRs that have been shown to interact with arrestins, see . Abbreviations: Fgr, a Src-family member; GLUT4, glucose transporter 4; Hck, hematopoietic cell kinase; IL-1R, interleukin 1 receptor; NSF, N-ethylmaleimide-sensitive factor; TLR, Toll-like receptor; TrkA receptor, nerve growth factor receptor; Yes, a Src-family member. †The binding of the partners to different conformational states of arrestin is designated, as follows: +, binds; +++, binds with high-affinity; ?, not known. 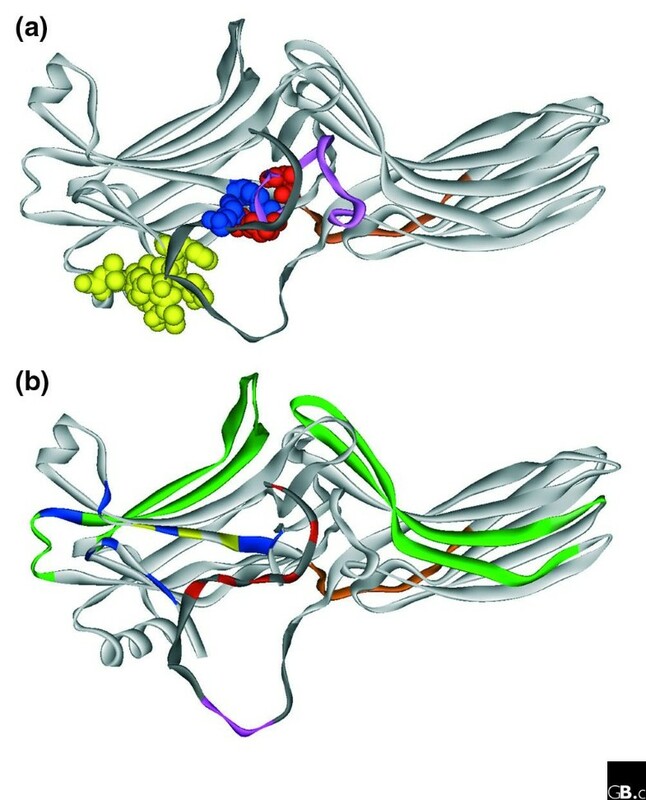 Receptor-binding elements have been mapped to the concave sides of both arrestin domains and the protruding 'crest' in the middle of the molecule that includes the 'finger loop' between β-strands V and VI (Figure 2b) [20, 30]. The interaction sites of the proteins that bind the arrestin-receptor complex must be localized on the non-receptor-binding side of the molecule from this, or in the detachable arrestin carboxy-terminal tail that is released by receptor binding. The interaction sites of arrestin binding partners that are recruited to the complex have never been properly mapped, however, with the exception of clathrin and AP2, which bind to the arrestin carboxy-terminal tail . Arrestins interact with the small G proteins ADP-ribosylation factor 6 (ARF6) [32, 33] and RhoA , their regulators ARNO (ARF nucleotide binding site opener) [32, 35] and the guanine-nucleotide dissociation stimulator RalGDS , components of MAP kinase cascades [37, 38], c-Src and other non-receptor tyrosine kinases [39–41], phosphodiesterase PDE4D  and others (Table 3). There is one common theme in the seemingly disparate functions of these multi-faceted adaptors: arrestins bring proteins together to make things happen. By interacting with several partners simultaneously, arrestins orchestrate signaling in space and time and direct enzymes to particular cellular compartments and substrates. Receptor-bound arrestins serve as scaffolds for MAP kinase cascades, bringing together apoptosis signal-regulating kinase 1 (ASK1) and c-Jun N-terminal kinase 3 (JNK3), as well as the kinase c-Raf-1 and extracellular signal-regulated kinase 2 (ERK2), thereby facilitating signaling in the ASK1-Map kinase kinase 4 (MKK4)-JNK3 and c-Raf-1-MAP/ERK kinase 1 (MEK1)-ERK2 pathways [37, 38]. Curiously, arrestin3 also facilitates deactivation of JNK3 by recruiting the dual-specificity phosphatase MKP7 . When ERK2 and JNK3 are activated by the arrestin-receptor complex they stay bound and therefore remain in endosomes and do not translocate to the nucleus [37, 38]. Arrestins also recruit ubiquitin ligases to the receptors: the E3 ubiquitin ligase Mdm2 mobilized by mammalian non-visual arrestins ubiquitinates GPCRs , and the E3 ligase Deltex mobilized by Kurtz ubiquitinates the Notch receptor in Drosophila . Arrestin3 binds the multi-functional anti-apoptotic protein kinase Akt (also known as protein kinase B) and its negative regulator protein phosphatase 2A (PP2A), facilitating deactivation of Akt in a manner dependent on dopamine receptor stimulation . Arrestin3 also interacts directly with IκBα, an inhibitor of NF-κB, preventing its phosphorylation and degradation and thereby modulating the activity of NF-κB . Non-visual arrestins regulate NF-κB activity in another way, by interacting with the tumor necrosis factor receptor-associated factor 6 (TRAF6) and preventing its autoubiquitination and activation of NF-κB . In addition to hundreds of GPCR subtypes, arrestins also bind several membrane proteins that do not belong to the GPCR superfamily and regulate their signaling and/or trafficking (Table 3). These include the insulin-like growth factor 1 receptor (IGF1R) , the type III transforming growth factor-β (TGFβ) receptor , the low density lipoprotein (LDL) receptor  and the Na+/H+ exchanger NHE5 . A dramatic conformational difference between free and receptor-bound arrestin provides the structural basis for the differential interaction of various binding partners with these two functional forms of arrestin [1, 53]. However, many of the partners believed to bind selectively to the arrestin-receptor complex have been found to interact robustly with free arrestins, for example, ARF6 , JNK3 [24, 54] and Mdm2 [24, 55] (the latter even prefers arrestin 'frozen' in its basal conformation ; Table 3). Some binding partners, such as microtubules  and Ca2+-liganded calmodulin , interact with the same surface of arrestin as is engaged by the receptor; this means that they can interact only with free arrestin and thus that they compete with GPCRs. The fact that the affinity of arrestin for GPCRs is in the sub-nanomolar range  and that for microtubules  and calmodulin  is in the micromolar range suggest that the active phosphorylated receptor always wins, but other functional forms of the receptor might not. Indeed, competition between rhodopsin and microtubules has recently been shown to underlie the dramatic redistribution of rod arrestin in light- and dark-adapted photoreceptors in vivo . The expression of rod and cone arrestins is limited to their respective photoreceptor types in the retina, although both are also present in pinealocytes. The intracellular concentration of rod arrestin in rod photoreceptors is enormous (over 100 μM) . Virtually every mammalian cell expresses both non-visual arrestins [11, 59]. Non-visual arrestins are certainly present in mouse neural precursors at embryonic day 12 , but given that arrestins have a role in the early development of zebrafish, in which functional knockdown of arrestin3 recapitulates the phenotypes of Hedgehog pathway mutants , arrestins are probably expressed much earlier in development. From C. elegans to mammals, the highest expression levels of non-visual arrestins are found in neurons [5, 15, 61]. In rat neural precursors, arrestin2 and arrestin3 are expressed at comparable levels (approximately 30 nM). During neural development the expression of arrestin2 mRNA and protein increases dramatically, so that in mature neurons arrestin2 predominates, with intracellular concentrations reaching approximately 200 nM (compared with about 10 nM of arrestin3) . There are neuronal types, however, that express arrestin3 almost exclusively, such as olfactory epithelial cells . Both mammalian visual arrestins and arrestin3 are predominantly cytoplasmic, whereas the subcellular distribution of arrestin2 varies: for example, it is more abundant in the cytoplasm of striatal neural precursors and neurons and mostly nuclear in the pyramidal neurons [15, 24]. Although they do not have identifiable nuclear localization sequences and only arrestin3 has a recognizable nuclear export signal in its carboxy-terminal tail, all mammalian arrestins enter the nucleus and can be exported by different pathways [24, 54, 55]. In the process of export, they remove their interaction partners JNK3 and Mdm2 from the nucleus [24, 54, 55]. The subtype that is found most often in the nucleus, arrestin2, has a role in the regulation of histone acetylation and gene transcription . Knockout of Kurtz, the only non-sensory arrestin in Drosophila, is embryonically lethal, as is the simultaneous knockout of both non-visual arrestins in mice [61, 63], whereas mice lacking either arrestin2 or arrestin3 are grossly normal . Thus, a functional non-visual arrestin is indispensable for normal development, but the two mammalian subtypes can serve as backups for one another. Probably for this reason, no human disorder associated with the loss of function of either non-visual arrestin has been described so far. The loss of rod arrestin underlies a form of congenital night blindness, Oguchi disease . Considering the number of arrestin interaction partners that participate in life-and-death decisions in cells (such as Src, ASK1, c-Raf-1, ERK2, JNK3, Mdm2, Akt and IκBα), it is hardly surprising that arrestins have a role in cell death and survival. The effects of arrestin vary with the system, however. Stable arrestin-rhodopsin complexes in Drosophila photoreceptors induce apoptosis [65, 66], and the complex of arrestin2 and the receptor for the neuropeptide substance P induces non-apoptotic programmed cell death through activation of ERK2 and phosphorylation of the nuclear receptor Nur77 . By contrast, arrestins promote activation of phosphatidylinositol 3-kinase that is dependent on the insulin-like growth factor receptor and has an anti-apoptotic effect , and they block GPCR-mediated apoptosis . The mechanisms of arrestin-mediated cell death and survival remain to be elucidated. As far as the origins and evolution of arrestins are concerned, several questions remain. First, did the arrestin domains, which can fold independently, emerge independently? Thus far there is no known protein that has only one of these domains; even the 'third cousins' in fungi and protists have homologs of both domains in the right order. Second, do plants have arrestins? Plants are the only large group of eukaryotes in which no arrestin-like proteins have been described. Their discovery may help to answer the first question. Third, is arrestin2 really a mammalian invention, or is it simply by chance that no close relatives have been cloned from lower vertebrates? From a structural standpoint, the most important piece that is missing from the puzzle is the structure of 'active', receptor-bound arrestin. We have high-resolution crystal structures of three arrestins in the basal conformation, as well as three structures of the inactive prototypical GPCR, rhodopsin, but these are the functional states of these two proteins in which they do not interact. Proposed models of the arrestin-receptor complex [17, 18] are derived from a lot of indirect evidence, but they are educated guesses, not the real thing. The structure of the complex would answer biologically important questions regarding its stoichiometry. The shape of the complex would shed light on its scaffolding functions and explain why its formation facilitates signaling in so many pathways. We do not even know whether there is just one specific conformation of arrestin in the complex, or whether arrestin can assume a whole family of active conformations once the clasps holding it in the basal state are released by the receptor, as some experimental evidence suggests . Microtubule-bound arrestin assumes yet another conformation, distinct from that of the free and receptor-bound forms , but we know almost nothing about the functional capabilities of this state of arrestin. Several laboratories using a wide variety of methods have mapped arrestin elements involved in receptor binding, so that we know exactly which side of the molecule faces the cytoplasmic tip of the receptor. The 'footprints' of microtubules  and calmodulin  on the body of the arrestin molecule, and the relatively small clathrin- and AP2-binding sites in the arrestin carboxy-terminal tail  have been identified with reasonable precision. The interaction sites for the great majority of the non-receptor binding partners have been localized very imprecisely or not at all, however. With very few exceptions, we do not know whether some signaling proteins prefer a single arrestin conformation out of the three known ones, let alone which partners bind preferentially to which functional state of arrestin. In addition, the very modest size of arrestins (40-45 kDa), along with the enormous number of known binding partners of similar or greater size, strongly suggests that arrestin in any conformation cannot interact with them all simultaneously. Thus, certain groups of arrestin partners must compete with each other for the overlapping binding sites. Which proteins can 'share' arrestin because their binding sites are far enough from each other, which partners compete, how this competition is regulated, and what factors determine the 'winners' are the key questions that need to be addressed experimentally. In summary, we know that arrestins do a lot more than simply block binding of G proteins to active receptors. Arrestins are multi-functional regulators at the crossroads of multiple signaling pathways. The next challenge is to understand the fine molecular mechanisms of their functional interactions with an incredible variety of signaling proteins. These studies have clear therapeutic potential as they will provide a firm foundation for the targeted manipulation of arrestin function. The following files are available. Additional data file 1 is a table of the estimated evolutionary distances for groups of arrestin proteins; Additional data file 2 is a figure showing an alignment of arrestin sequences. We thank Susan M Hanson for critical reading of the manuscript. This work was supported by NIH grants EY11500 (to V.V.G.) and NS45117 (to E.V.G. ).